You Have More Power than You Can Imagine. Because I’m a Capricorn and I do 1000 things at once, I put in an application to be an official blogger for the Sacred Circularities Hula Hooping retreat in Bali this year. If you’re interested in reading the whole post about that, you can go hop over to my hooping blog. I turned in my entry last night and had a dream of green shoots of flowers pushing up through the dirt last wnight. This morning I had a message in my inbox asking me to confirm if I will be able to come or not to proceed forward in the selection process. What a beautiful way to begin Ostara. 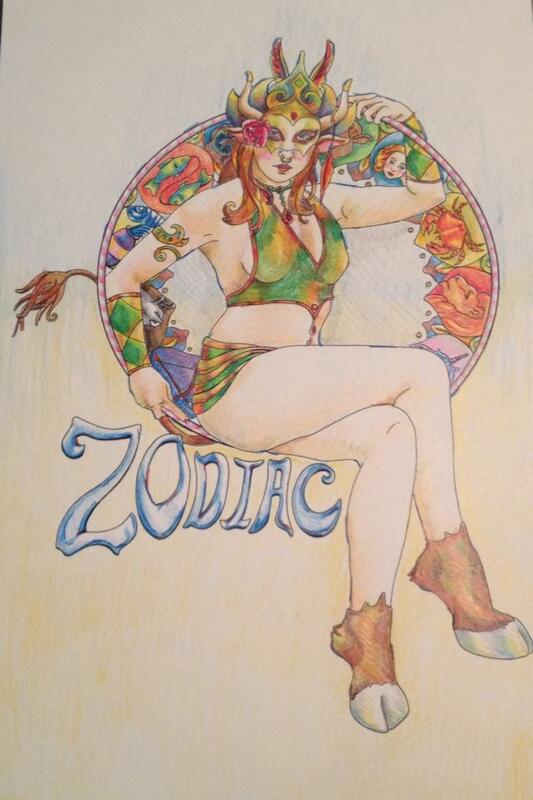 I also finished coloring a super awesome poster for the Blue Moon Circus Zodiac show. My friend, Laurel, who is also the leader of Blue Moon Circus, asked me to color the poster she drew and I think that our collaborative effort turned out great! She is definitely one of the artists that I have in mind to approach about drawing my Tarot deck that will be the companion to my novel. Things in my life are changing and shifting a lot and I keep thinking back to the card I pulled at the beginning of Brigit’s class that represents me: The Magician. Recently, I’ve felt my personal power returning through my studies of the Tarot and my focus on the Tiphareth Sephoriah. I really have to thank Anita D. Kraft for her wonderful book The Qabalah Workbook for Magicians (or you can go here to learn more) which has been a brilliant aide in my Qabalah studies. When I started studying Magickal Qabalah, I started to regain a lot of my confidence and power that I lost due to a lot of negativity that entered my life and made me feel powerless for a while. Magickal Qabalah and Tarot go hand and compliment each other beautifully so once I started combining the two, there’s been no stopping me. We’ve been studying Court Cards in Brigit’s class and I feel like the Knight of Wands, ambitious, ready for action and on a mission with passionate enthusiasm. It’s interesting because in readings for myself, I pull the Queen of Wands for what I will become — grounded, nurturing, and in control of my energetic passion and enthusiasm. It’s a very interesting direction I sense myself moving in and I’m letting that virgous energy or the Knight of Wands and that magick that the Magician possess to see how much I really can manifest. After all, I did manifest a 10 year juant around the world before I crashed and lost my wings after the Great Tohoku Earthquake but I feel like I’m ready to get my wings back. As for the webinar with Brigit, I enjoyed it as always tonight. I feel like I’m really nailing down the court cards and I’m using the workbook for the Ultimate Tarot Guide to go through each chapter of my book and pin down exactly why I chose that card to represent that chapter. It’s brought out a lot of interesting points that are tied in with the Tarot that may help me get a better handle on what my characters need to appear more grounded and realistic. I’m also enjoying pin pointing where I subconsciously put Tarot imagery and references into the plot. Tonight I sat down at my altar and meditated on everything I want to grow in my life for Ostara. I thanked the God and Goodess for all the blessings and abundance they brought me. I’m doing some folk magick to celebrate Ostara with some friends on Saturday but today was a simple, private celebration for me at home. I’m really into essential oils for aromatherapy purposes so I mixed up a nice blend in honor of Ostara and used my oil burner to fill my altar area with the aroma. I used a balance of feminine and masculine scents to honor the potential of abundance the God and Goddess bring with the Equinox. This entry was posted in mysticism, self help, spirituality, Tarot, Writing and tagged biddy tarot, magick, manifestation, ostara, qabalah, tarot. Bookmark the permalink.